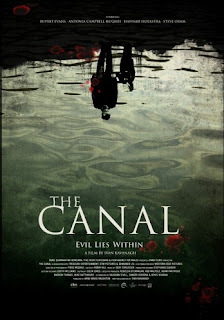 Tag line: "Fear will pull you under"
As a mystery, 2014’s The Canal doesn’t really work; odds are you’ll figure out what’s going on early in the film. What it is, though, is an effective ghost story, one that’s certain to send a few shivers running up your spine. Several days later, the authorities pull Alice’s lifeless body from a canal that runs through their neighborhood. Aside from dealing with his own grief and that of his young son, the now-widowed David has to put up with Police detective McNamera (Steve Oram), who flat-out accuses him of murdering his wife. But David is convinced the ghost of the killer who once resided in his house is to blame, and with the help of his co-worker Claire (Antonia Campbell-Hughes) and an old-time movie camera, he intends to prove his theory is correct. Did a ghost really murder Alice, or is David losing his mind? Rupert Evans delivers a sometimes heartbreaking performance as the sensitive David, and because he’s such a likeable guy, we feel his pain when he learns his wife has been seeing another man. But as we eventually discover, David is also a strong-willed investigator, and to prove the ghosts of the past are responsible for Alice’s death, he delves deeply into the history of his house and its former occupants. Naturally, nobody believes his story, so he tries to obtain proof to show that the evil spirit of a century-old murderer does, in fact, exist. It’s in these scenes that The Canal truly excels. Aided by a silent movie camera he borrows from work, David shoots the interior of his house, and the developed film reveals a ghostly presence lurking in the corner of nearly every room. Yet as creepy as these images are, the movie’s most effective scene has David shooting a roll of film by the side of the canal, resulting in a sequence that, while clearly inspired by The Ring, will scare the hell out of you. Though it does borrow heavily from other movies (aside from The Ring, there are a few nods to The Shining as well), and anyone with the slightest knowledge of horror movies (or thrillers in general) will see its ending coming from a mile away, The Canal is an entertaining picture while it lasts, and even if its finale is ultimately a disappointment, the ride to get there is pretty damn intense.